Most of the items in my closet have a deep meaning to me. I have a strong memory, which sometimes comes in handy in parking lots, that attaches me to the strangest of things. This dress was purchased for me by my in-laws in 2007 at a mall in California. I can recall feeling festive in the dressing room, so excited to be in warmed weather in the middle of December with my boyfriend of a year. It's a good memory, and this dress has many more attached to it. These shoes were one of my last buys in Cincinnati before moving to Harrisburg on one of mine and Jason's many trips to the local Target. That's our happy place, and a hard-and-fast rule that we live within 15 minutes of one. For all of these items, the meaning is completely given by me and meaningless to anyone else. 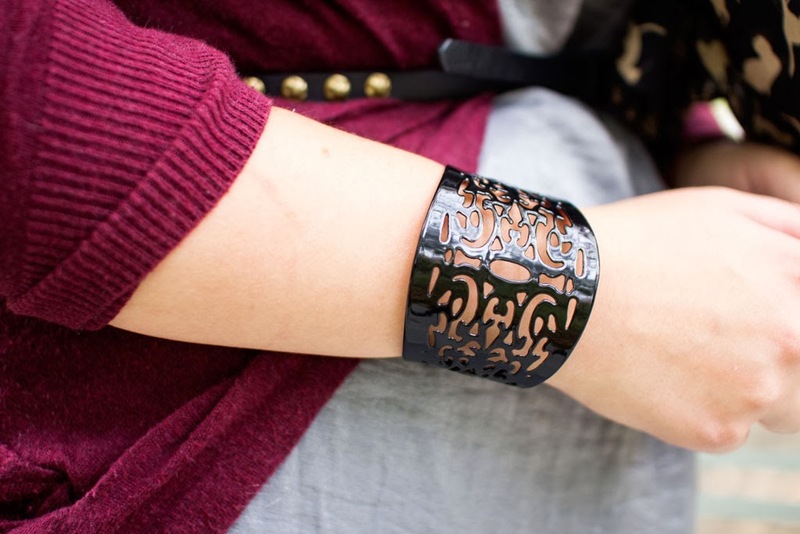 This cuff on the other hand comes with meaning. That's what fair trade is to me - it gives a definite meaning to items. All of the items from Ten Thousand Villages come with a story, a positive meaning to buying something that is otherwise another piece in the sea. You can read about the company or village that your item comes from - for instance, this retro cuff comes from CFM Market Linkages in India. They link together many communities in India to market here. Ten Thousand Villages ensures that their products are fair trade - meaning that the workers make a fair wage. And they have been doing that since the 1940s. That's over 60 years - I didn't even know fair trade was a thing back then! They have a lot of items too, since they are like a marketplace, so it's a good place for more than jewelry and clothing. They are based out of Akron, Pennsylvania, which isn't but a few miles from my home, so it drives the meaning for me even more so. Local business doing global good. How's that for a piece with a great story? Way to rock the Missoni heels!